a fellow at work wanted to see my Svea 123R when he heard about it. i showed it to him, in the morning. in the afternoon he came back to the shop and gave me this small carbide lamp. Oops prolly has a dozen of them. I used to have one of those back in the old country. Got lost in the move. Never could get it work properly. mine's burning nicely right now. nice stable flame. decent light. Very nice gift Daren. Says alot about you that your fellow worker would give you such a fine specimen, knowing that you would appreciate it more than him. It looks almost new. Congrats Daren on a nice addition to your collection. DarenN wrote: a fellow at work wanted to see my Svea 123R when he heard about it. i showed it to him, in the morning. in the afternoon he came back to the shop and gave me this small carbide lamp. seeing as Zelph is giving them away this week, i'll trade you mine for a Borde Bomb. unfortunately, i don't have any cats, dogs or first-borns to add to the pot. you can have my ex-wife if you can find her. Daren, there has to be a way to make a stove out of it!!!!! 10 years ago I had the base of a commercial carbide lamp that was 2 feet hig and it's base was 18 inches in dia. Hade 2 handles on it sides to carry it. Was used by a construction company for remote lighting. 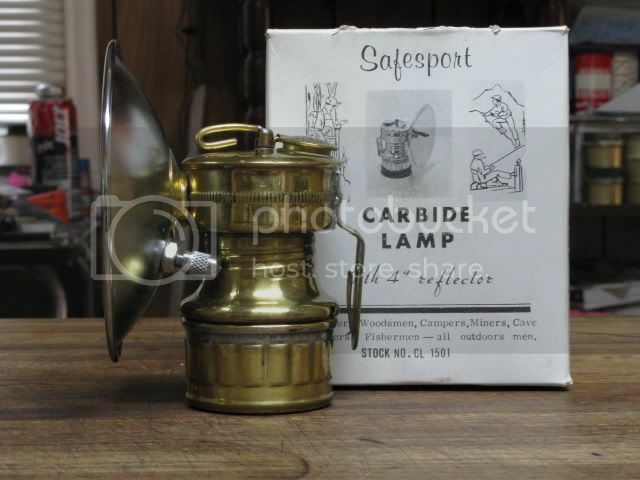 Here's a site with some info on carbide lamps. There are still quite a few cavers that use carbide lamps. However, difficulty in finding carbide and the introduction of the LED headlamp have reduced their number considerably. Had that lamp ever been used before??? MT_Vert_Caver wrote: Here's a site with some info on carbide lamps. Great site you linked to. I found the name of the lamp that sells for big bucks, it's called the "Black Diamond" rated a number 10 on a list of 10 being the most rare/collectable. MT_Vert_Caver wrote: Had that lamp ever been used before??? the fellow that i got it from is a competition handgun shooter. i'm told that the shooters use carbide burners to blacken the sights on their pistols. most of them use a burner that still burns carbide but is designed for their use, and has no reflecter.